They shared their views and some of the things they hope to achieve during their time leading the student body. They were keen for senior students to mentor and buddy not just the new junior classes, but also the year 11 students beginning the level one National Certificate in Educational Achievement. They want to introduce them to the idea of regular assessments throughout the year and encourage them to aim higher than the minimum “just sufficient” number of units to pass. “We want to encourage kids to believe in themselves and their abilities, and show Otaki College has a good reputation for academic achievements,” Clare said. The buddy system works well with the junior students, especially at the beginning of the year. It helps them get to know people, and find out what sort of things they like doing, especially events. The nine associate heads each lead one of the four councils, Kyuwon Kim and Toia Temperton-Royal heading the Cultural and International Council, Adele Finnie and Isla Gray responsible for the Health and Environment Council, Erin McArley and Aisea Nelson-Latu leading the Sports Council and Isobel Cudby, Francesca Flaws and Grace Teu guiding the Arts Council. 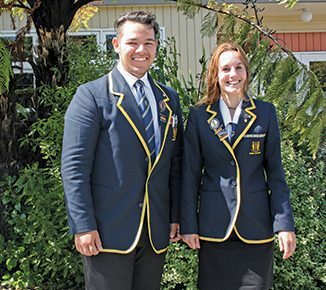 Otaki College has a very strong leadership team among the students. With 22 international students attending the college, there is plenty of room for inclusion of the some of them in leading position. Kyuwon Kim, from South Korea is one of the associate heads leading the Cultural and International Council and Ines Depner from Germany is the student representative on the College Board of Trustees. With the house captains having more involvement in planning and organising events, this year, it increases the number of people available. They have already been helping at assemblies and running activities at the beginning of the year. It helps people to get to know their houses and builds the house and team spirit. And so, by the end of the year, the last at college, they hope to have achieved a united leadership team, “with everyone knowing each other well. Everyone has different strengths, which helps,” Clare said. A new year, a new student leadership team, with new ideas, hopes and aspirations to achieve, before their final exams and the end of their school days.